The Kepler Mission launched this weekend from Cape Canaveral is searching out Earth-like planets for three years or more. The instrument is a custom 15-foot-long, 0.95-meter diameter telescope called a photometer or light meter, with a 105-square-degree field of view. Its vision from space, unhampered by Earth's atmosphere, will more easily identify a planet's transit. 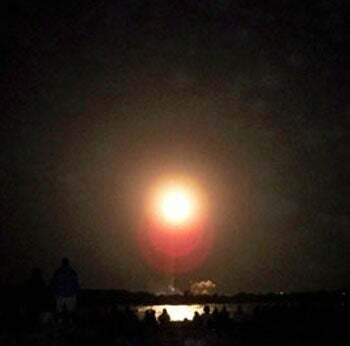 We watched the Kepler launch from the beach at Jetty Park, just south of Port Canaveral. People stopped by the park in the late afternoon to pick up parking passes and watch the gantry being pulled back. Some had stopped by earlier in the week to watch the first and second stages of the Delta II rocket assembly. At twilight brilliant white floodlights came up to illuminate the rocket on the launch pad. It was cool down on the beach with a light wind, but the sky was perfectly clear. The reflected light from the three-quarter moon was bright enough to cast a shadow and the Big Dipper hung upended over the launch site in the northern sky. A few minutes before launch people with cell phones called friends or family at home watching the launch on NASA TV and relayed the countdown to us as we watched. The Delta II roared off the pad in a bright white light, vertical at first, then slanting off to the east. A few seconds into the launch, the first stage rockets fell away in a girandole like glowing embers while the second stage continued to climb. We watched until the rocket had rumbled out of sight and the sky was dark once more but continued to get updates until Kepler had achieved initial orbit for its single pass around the earth. Scattered cheers and clapping came from along the pier. It was flawless.